We currently serve 240 students through a partnership with The Power of Education Foundation. The school, located in Fontamara, has kindergarten through ninth grade. 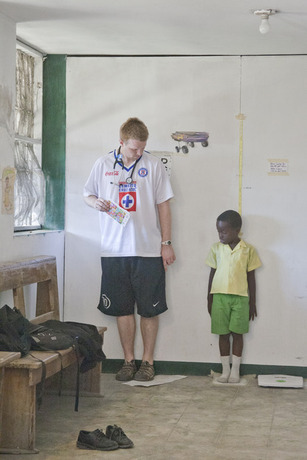 KHH also serves a second school near Port Au Prince. Immaculate Conception is a primary and secondary school with 250 students. 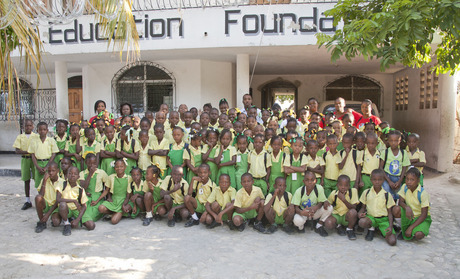 The photo to the right is of the students and staff at the school in Fontamara, Haiti. Kids Health for Haiti is a nonprofit organization working to improve the lives of children in Haiti by using primary care medicine to improve their health. KHH believes that preventive medical care and a medical home is essential to optimizing educational achievement. Anemia, malnutrition, chronic and infectious dieases make learning a challenge. KHH works collaboratively in schools and community health centers to provide a medical home for the students. Medical professionals and trainees participate in trips to work side by side by our Haitian colleagues. We have a partnership with O.S.A.P.O., a Haitian run community health center located 100km north of Port Au Prince near Montrouis. We believe that medical knowledge is power and that our students, their parents, medical volunteers and our Haitian colleagues all have information to share with one another!